The October real estate market in Prince Edward County continued the “return to normalcy” which began after the market peaked in May. Detached home sales for the month were slightly below the average for October sales for the preceding three years. Inventories also tracked slightly below the 3-year average. The most striking news for October was the change in the mix of homes selling shown in the chart (above). 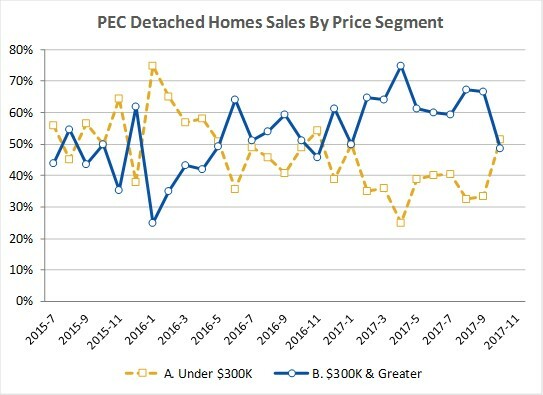 Ever since January 2017, homes in the over $300K price range have out-sold less expensive homes, but this changed in October when the majority of homes sold were in the under $300K price range. Historically, most homes selling over $300K go to buyers from Toronto. The drop in sales over $300K suggests that Toronto buyers sat on the sidelines during October, though it’s too early to tell whether this is an impact of the slowdown in the Toronto real estate market…or the fact that rain fell three out of four weekends in October.